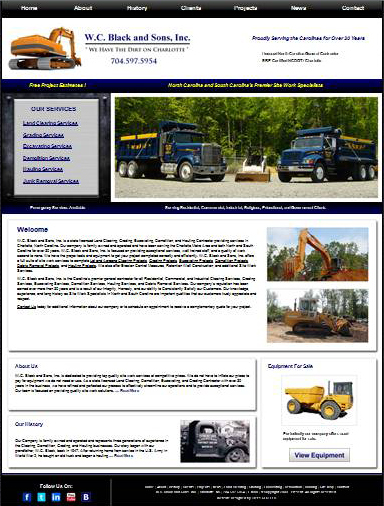 demolition website | W.C. Black and Sons Inc.
W.C. Black and Sons Inc.
Demolition, Excavating, and Grading Contractors. On 06 June 2014, W.C. Black and Sons, Inc., a licensed general contractor in Charlotte, North Carolina, launched its second website. This new website was developed to complement the company’s main website (http://www.wcblackandsons.com), which provides a general overview of the company history, capabilities, and products/services offered. 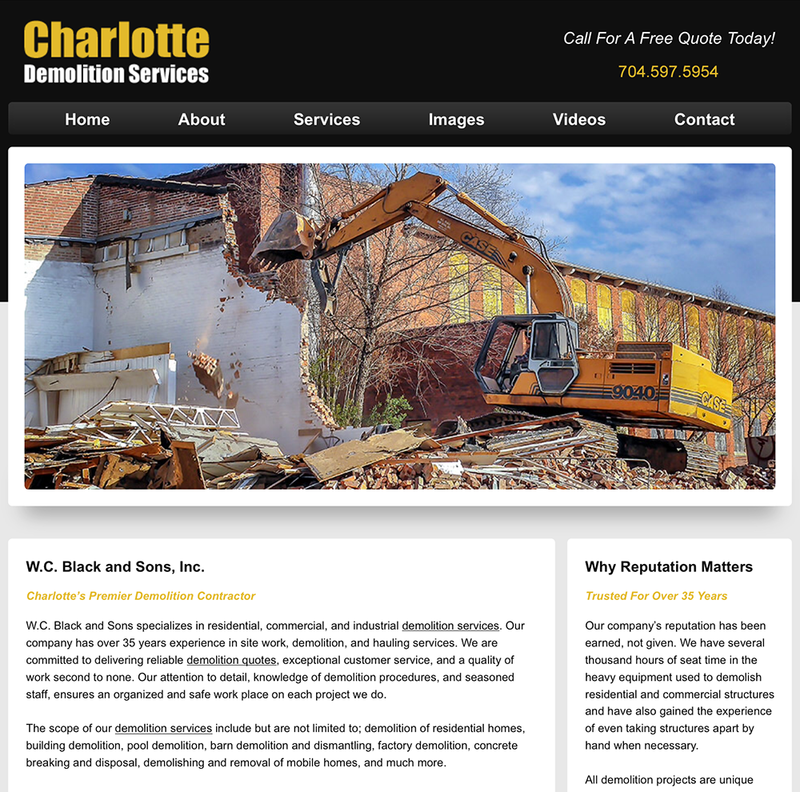 The new website (http://www.charlottedemolitionservices.com) launched on 06 June 2014 is intended to focus on the extensive Demolition, Dismantling, and Wrecking capabilities of the company and accomplishes this goal through a clean design and simplified user interface. This layout should enhance overall user experience and aid potential clients in their search for demolition quotes from a qualified demolition contractor for future residential or commercial projects within the Charlotte Metro Area and both North and South Carolina. The website contains content which should prove helpful to those searching for the right contractor for their project to include; information about W.C. Black and Sons’ demolition expertise and capabilities, images and videos from past projects, and suggestions of what information to consider when seeking a professional contractor to meet the specific needs required by their individual project. W.C. Black and Sons intends to continue to update and maintain both websites in the future in efforts to better serve its customers and to continue to provide the most accurate, reliable, and helpful information to those in the process of searching for and selecting a licensed general contractor for their demolition, site work, and or hauling projects within the city of Charlotte and surrounding areas. If you’re looking for an experienced demolition company in Charlotte, take a look at W.C. Black and Sons, Inc. and discover why we are the best choice for demolition and dismantling solutions in the area. Contact us today at 704.597.5954 to schedule a free project quote or visit us on the web to learn more about our capabilities and our experience operating within the Carolinas for more than 35 years. W.C. Black and Sons, Inc. launched its latest re-design on Sunday, 17 October 2010. This latest version is far superior than our previous site. The new design is clean, simple, and easy to navigate. We have added additional content about our company, better quality imagery, incorporated video, and reorganized site layout in efforts to enhance visitor experience while on site. Informational navigation elements now flow across the top of the page. This allowed us to group all major services together on the left. These small changes make searching our site easier, by co-locating like elements together, visitors are able to view each main division at anytime from any page from a logical location. The design team at Tier 1 SEO did an excellent job translating our vision into reality. Our goal for the re-design was to achieve a finished product that was fresh, unique, and user-friendly. As a family owned and operated business for over 30 years, it was important to us to receive a finished product that actually displayed our history, knowledge & experience, capabilities, and our focus on providing quality site work services/solutions. We also believe in showing our company performing actual work, on real job sites, with our own equipment and personnel. “What you see is what you get.” No stock photography to portray our company as something it’s not. Our equipment has dirt on it because we use it every day. We believe in doing business with honesty and integrity and we wanted our website to show just that. Need a contractor for your Demolition, Land Clearing, Grading, Excavating, Hauling, or Junk Removal Project? Take a look at W.C. Black and Sons, Inc., “We Have The Dirt On Charlotte“. Welcome to W.C. Black & Sons, Inc.
W.C. Black and Sons, Inc.